The Town of Bethel, Connecticut is at the forefront of tourism marketing and economic development. As part of the town’s holistic approach to promoting local businesses, attracting tourism and encouraging economic development, the Chamber and Economic Development Commission brought SandorMax on board to develop branding and a robust website to achieve its business development goals. The new website had to serve multiple audiences with a seamless consumer-friendly user interface while fulfilling the comprehensive functional requirements of the Chamber of Commerce to support its members and businesses. There were many stakeholders with distinct objectives and wish lists that had to be fulfilled successfully by one unified website. The process began with the development of a bold and memorable brand identity for the destination initiative. We designed a logo that conveys the festive, fun and artsy atmosphere for which the town is known, along with a vibrant color palette and fun, exploratory website design that supports discovery. The tagline “There’s always something to discover” suggests the many cultural, recreation and family activities the town has to offer for visitors and residents alike. We developed the Discover Bethel website with a lively and visually rich consumer-facing interface encourages exploration and discovery. Automated event and news streams keep visitors posted on the latest happenings in town to encourage engagement and frequent visits. Behind the scenes, the robust website seamlessly integrates a comprehensive membership platform to support an interactive business directory of Chamber members. We developed all visual content and copywriting to serve both the consumer audiences of visitors and town residents, as well as to promote town businesses and advance economic development. 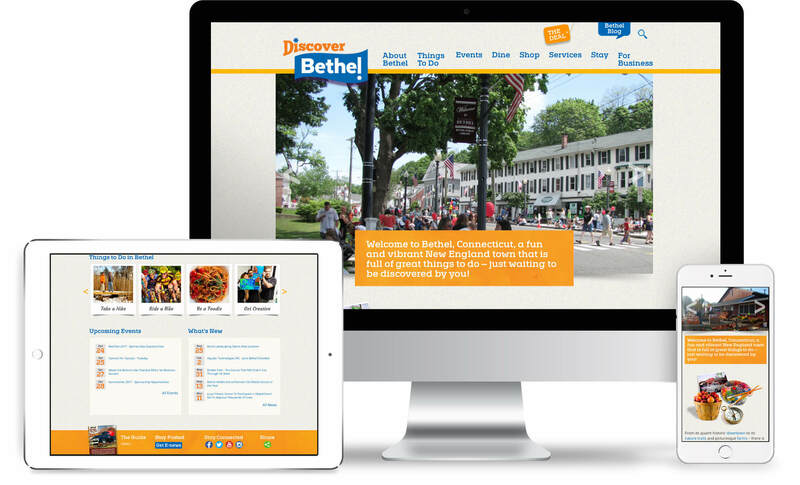 By broadcasting all that is great about Bethel, the new website has been pivotal in attracting visitors, businesses, and even new residents to this charming New England community. The website has become the go-to resource for information, news, events, resources and business information for the town and has boosted exponential increases in visits to the website – and to the town. “We couldn’t be happier with our choice of SandorMax for the branding and development of our community website. The project required the expertise to manage and design a comprehensive and interactive website, prepare content, integrate a third party vendor’s back end system and the development of a complex member and business directory. Our high expectations were exceeded, on time and on budget.